UK Tour: Day 13. A shift of attitude in Edinburgh. A day off is welcome on a tour like this, but it requires such a sudden change that it often leads to problems. Low blood pressure, sure, but even more dangerous than that, it leads to a shift in attitude that is harmful to one's pocketbook. Yesterday, I spent about five hours meandering around Edinburgh, from the New Town to the Old Town and back again, popping in and out of cafes, shoppes, and potato shops. I was able to escape with merely one baked potato and two cups tea, but the temptation to consume was overwhelming. When I'm in tour mode, I never want to spend money. Every little trinket at a souvenir shop means business money lost, and tours less successfull. Gas over here is about $10/gallon (think about that the next time you fill up your truck), and a day off means hotel expenses, overpriced restaurant meals, and bottled water. Thankfully, I've got some wonderful friends here in Edinburgh who have lent me their sofabed and cooked me a fabulously delicious homemade macaroni and cheese meal for dinner. Sidenote: Do any of you put catsup on your macaroni? Everyone else at dinner was doing it, so I figured it wasn't just a trick. And it turns out, it's yummy. I had to keep reminding myself that despite being in Scotland right now, the mortgage is still due tomorrow. So my pounds and my credit card remained in my pocket. The closest I got to a splurge was on the walk home when I spied a charming little dress shop called Cookie, with it's red doors open to me on a delightful cobblestone street. It wasn't a fancy dress shop. Cotton sundresses demurely lined the windows, and I just had to go in. Sundresses, my friends, are my achilles heel, especially now that I've read reports about the fabulously hot weather in Louisville. There is very little better than skipping down the street in a proper cotton sundress and a big floppy hat, one hand wrapped around a strawberry ice cream cone, and the other wrapped around FWT's strong hand. I only tried on one dress, and I reluctantly put it back on the rack, as it cost £65 -- just over $100. But I tell you, it's getting harder to remind myself that this is not a vacation. Thankfully, we're back to gigging on Wednesday night, so I'll return to business frugality and stress. In the mean time, maybe I'll pop back in there this afternoon -- just to browse, you know. I kind of wanted to sing "8 More Miles to Edinburgh" this morning on the way into town, except that's not really a song. But it was every bit as exciting to be returning to Edinburgh as it is to return to Louisville after a trip. It's hard to explain the magic of this city, but every single time I see that castle on the rock, I get chills. It's just like living in a fairy tale, and I think that's inspiring/fun/magical/whatever word you like. As you may know, I also have a big thing for the Baked Potato Shop on Cockburn Street, so that was my first stop after catching up with a friend. It's not a fancy restaurant, but it's entirely vegetarian and a genius business plan. I first discovered the Baked Potato Shop when I was 19 and frolicking around Edinburgh one spring break with my college roommate, Lyzzard. She and I stayed at the hostel across the street, and I was amazed to find not just a vegetarian restaurant, but a place that was delicious, inexpensive, and creative. I think I ate a potato for every meal. And I've pretty much done that every time I've come back to Edinburgh. Today I overheard several folks talking to the owner about his imminent retirement and sale of the restaurant, and that gave me some mild heart palpitations. I'm not sure what Edinburgh would be like without the potato shop, but fortunately, I also heard him tell folks that the shop will remain open and mostly unchanged. So don't worry, folks, your potatoes are safe. I wonder if the shop will be hiring? Maybe I could start a new career as a potato-ista. For various reasons, DC has been doing all the driving, even though this isn't his tour and he's just here on vacation. I actually love driving on the left, even on the wee Scottish roads, but I'm not so comfortable driving a shifter car. I could get you to the hospital if necessary, but I freak out and panic when required to get the car into gear while on a hill. This is pretty much a daily requirement when driving through Scotland, and since finding an automatic rental car is both difficult and expensive, DC is left to the driving. It's okay with him, however, because he gets carsick as a passenger. So do I, but it's been less problematic since the passenger sits on the front left side of the vehicle over here. When I'm feeling nauseated, I just stare at the road and pretend like I'm actually driving the car. This doesn't always work though. I realize that the motion sickness happens when you're not expecting the motion. Sudden stops make my stomach turn, but I've managed to hold it all in so far. Today we decided to ditch the car and bring our instruments and a change of clothes over on the ferry to Mull. I think DC is looking forward to a day off from driving, and I'm looking forward to a good excuse to get some walking in. I've been working on a video, but time is precious here. Trying to balance sightseeing with work and sleep is the biggest challenge. This morning DC and I awoke at the Portree Independent Hostel, where I tried my best to be as obnoxiously loud as the French kids across the hall were while I was trying to sleep last night. Our days off aren't so glamorous because we don't have income on those days. Hence, we were rocking the hostel rather than the hotel. It was clean and brightly painted, and they provided free tea and coffee. DC hit himself repeatedly in the forehead after I downed the tea he prepared for me before he remembered that I act insane when I've had caffeine. He was then overjoyed when I made a proclamation: May 25 is heretofore known as "Castle Day." I know, I know, you're probably shaking your head in awe at the fact that Dan and I happened to be in SCOTLAND on the ISLE OF SKYE on Castle Day 2011. Don't be jealous though. We could only handle two castles, but they were both about 7's on the Brigid Castle Scale (similar to the Richter Scale). First, we hit Dunvegan Castle, which isn't a haven for vegans as you are probably imagining. It was a proper Scotland castle with gorgeously well-maintained gardens surrounding it. I wish the weather hadn't been so, um, wet, because I adore frolicking through gardens and waking up the faeries. The dungeon was perfectly creepy, and Dan got some good photos of me being mortally wounded by a broadsword. After Dunvegan, we headed southeast, leaving Skye via the Skye Bridge and trying our luck at Eilean Donan once more. If you recall, it was closed on our trip up here due to "adverse weather conditions," i.e. 100mph winds on a castle that lets you meander around the balconies that overlook the sea. It was open today, however, and we had a lovely time climbing ancient spiral staircases and admiring broadswords. Also, this castle is particularly familiar because it's been in so many films -- from "Highlander" to "Made of Honor." It was quite a site though, nestled on a wee island connected to the mainland by a bridge, with views that truly did make me gasp. Castle Day 2011 was a great success. If you've missed it, don't worry, May 25, 2012, will be bigger and better. We've got a day off today. It's a good and a bad thing on the road. These nightly gigs can be stressful, as you want to show up to soundcheck on time, but not all the venue-owners are as punctual. It's nice not to have to worry about what to expect. Today, DC drove us on a bunch of single-lane roads through frightening but dramatically beautiful scenery. I've been told that Skye is gorgeous, but it's impossible to explain something this mystical/magical/bizarre. It's like Jurassic park in some places, and it's Braveheart in others. Then you'll find palm trees resting by an ancient stone wall, overlooking a massive cliff drop-off. The way the clouds move through the hills, casting crazy shadows on the rocks and changing weather within minutes, is simply breathtaking. I mean breathtaking in the literal sense, as I am constantly having to remind myself that the difference between fear and exhilaration is a breath. Don't I sound like a refrigerator magnet? Either way, these roads are exciting. They aren't nearly as bad as what I remember of Ireland. Still, our rental car is bigger than I'm used to, and DC is still a bit nervous driving on the left, adding to the general stress of the car. But then I remember that we are driving through the ISLE OF SKYE, and how crazy/cool/exciting is that? Deep breaths make these oncoming coaches on a cliffside road a bit less terrifying. We still haven't been to a castle. I've got a hankering for sure, and Eilean Donan had better be open tomorrow. Otherwise, I'll be a sad puppy. Tomorrow night we play in Plockton, a tiny village just past the Bridge to Skye. I'm hoping for a fun evening in a quiet town. Meeting the people is my favorite part of being on the road, and I'm expecting good things from Plockton. It's amazing how the days fly by while you're on the road. We've had quite a bit of driving in the past couple of days, the first day because we were sightseeing, and the second because we played near Manchester one night and the Isle of Bute, Scotland, on the next. The locals flip out when you tell them you're driving 200 miles and a ferry to your next gig. To us, it's less than Louisville to Chicago, and that's doable in a morning. Funny thing is, is that driving is somehow more tiring over here. I think it's because it's the über-concentration on keeping to the left. You have to be vigilant, and it reminds me of that first month with a driver's license. You're afraid that every incoming vehicle is going to swipe you, and you have to concentrate hard on centering yourself in the lane. And if you think you're centered, you are likely about three feet too close to the curb/parked cars/ancient stone wall. This is because you steering on the RIGHT side of the car -- known as the passenger seat where we come from. If you're comfortable, you're probably about to run into something. Such vigilance makes one sleepy. Last night's gig in Rothesay was fantastic -- a packed cafe of music fans listening intenly and having a lovely time. DC and I are thinking about moving to the Isle of Bute. Everyone is so incredibly friendly, and there's a fantastic music shoppe. Also, they've got a castle with a moat, lovely beaches, and even a pack of seals. Okay, time to wake up DC before we miss all the sites. It was a great wakeup and refreshing thing to do, although when I think about it, it sounds like a crazy dream. "Hey, I had this wacky dream where I went to Manchester, met my friend Kirsty, and then we went swimming at this public pool where I got to swim in the fast lane." Oh yeah, like how I slipped in that part about being in the "fast lane?" Well, it's true. Makes me feel better about always being relegated to the slowest of the slow ... Lane 8 ... during swim team practice as a kid. I was feeling pretty good about myself, when I decided I'd "just lie down for a minute." Then I snuck my eyeshades on. Then it was 4:30, and I'd foiled my plans. Swim tired. It never fails. Meals for today*: Bowl of Fruit. Fresh vegetable salad. Some sort of squash soup. Macrobioirsty through the streets of Manchester as we walked to a natatorium near the University. It was glorious, jumping into that water. I swam about a half mile before deciding I didn't want to get super-swim-tired, and I felt wonderful as I headed over to the bubbly spa pool. Meals for today*: Bowl of Fruit. Fresh vegetable salad. Some sort of squash soup. Macrobiotic ginger stir-fry. Piece of french chocolate. Piece of Swiss pretzel candy. Chamomile tea. *All prepared by my gracious host, and what will indubitably be the most nutritious meals of the tour. 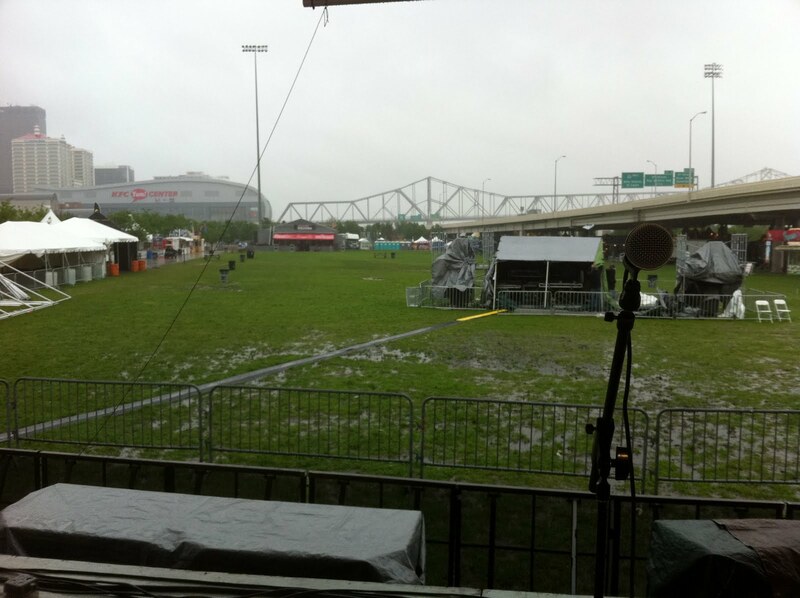 I've played a lot of shows in Louisville recently, in preparation for a tour of the United Kingdom. Today, it begins. The life of an indie-artist isn't glamorous, but I'm using the power of the Universe to make it a bit more comfortable than usual. This morning I write you from the Delta SkyClub at the airport, which has a lovely display of free bagels, oatmeal, coffee, chocolate-covered pretzels, and vodka. I am currently consuming four of those, and I'll let you decide which ones. Today I'll be hitting four different airports, but I have only two flights. Do that math, folks. Why? One of those Seinfeldian moments when I fly into LaGuardia, but make a connection at JFK. That means getting from the far end of Queens to the far end Brooklyn (with no time for a detour to Bagel Bob's on University Place) and TWO trips through airport security. But back to the power of the Universe: it's going to be a smooth, fun, ride, and my bag will be awaiting me in Manchester, England. *Those fancy AmEx cards are totally worth the service and free stuff in the airport business lounges. *I am clearly a spoiled brat. Or maybe it's just another Seinfeld moment ... once you've traveled well, you really can't revert. Hence the reason I'm done with dirty tour vans and abusive lead singers. *My accordion is not as heavy as I remembered it. Either I've been working out in my sleep, or it's merely the beginning of a tour. Ask me how heavy Big Red is in two weeks. *It really does make you feel better to check your purse/pocket for your passport every three minutes. Now if you could all please now join me in sending out Business Class Vibes to the Universe, that would be great. Thanks. Tomorrow morning, I'm off to play at least two weeks straight of shows, mostly in Scotland. For a list of gigs, in case you're in the area, visit my website: http://www.brigidkaelin.com/Site/Tour.html. The rest of you can sit back, relax, and check out my tour blogs over the coming weeks. I'm promising some video blogs this time 'round, which I assure you will be every bit as exciting as "Peter Searcy Tries Black Pudding," one of my more controversial vlogs, which you can view below if you are reading on my actual blog (brigidkaelin.blogspot.com) or you have to click on the link if you're reading on the Facebook auto-import. I'm pretty much packed, I think. My suitcase is mostly filled with my saw and CDs, since I decided I can wear the same hoodie for days and only DC will have to smell me. Also, I'm going to put a moratorium on whining about gas prices in the US. Gas has spiked to over $4.00 a gallon here. To my UK friends, that is about 62pence a liter. We silly Americans are flipping out about those kind of prices, when it's hovering around $10.00/gallon in the UK and has been near that every time I've visited in the past several years. People would take road trips left and right if gas was £2.50/gallon. The dollar has done its usual thing for when I travel over there. It drops just as I'm getting to the UK, which is cool because I'm getting paid in pounds. Unfortunately, the pound consistently drops just as I'm about to trade all those hard-earned pounds back into dollars. I think I'll just keep them as pounds this time and play Monopoly with it when I return. Am I forgetting anything? I've got the basics: passport, work permit, credit card, accordion, and a few Xanax. I don't fly well lately. I guess that's all I need, really. Prepare yourself for some fun blog-reading over the next few weeks. There's been all kinds of boring and stressful stuff going on, which I won't bore you with here. Instead, get ready for some crazy Scottish adventures. I'm talking Highland cows, vegetarian haggis, late-night lock-ins at the pub, and ancient ruins. In between all that, some fun gigs. Today I'm trying to focus on packing. 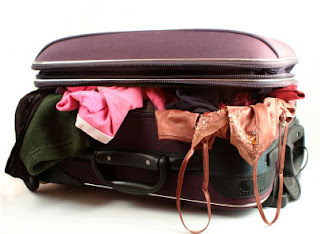 Packing lightly is the key here, for many reasons. Primarily, it's because the airlines now charge like crazy for a checked bag, and we've already got guitars, accordions, mandolins, and merchandise to bring. Then there's the wee little cars that they drive in Europe. Lugging around two big suitcases plus instruments and merch just isn't an option. So I bring you Travel Tip Collection #1: How to pack for a month in a backpack and still remain friends with your travelmate. 1. Tide Travel Sink Packs: You have to do laundry at least every other day. You'll be washing small amounts and likely doing it in the sink, so these little packets are perfect. You can also bring an empty travel shampoo bottle and fill it with liquid detergent, but I like the small packs. They are lightweight, and every ounce matters. 2. Forget Fashion and think Layers. The weather in the UK is unpredictable, but generally mild. Start with a t-shirt and build out from there. 3. Choose black or brown and stick with one. Everything I'm bringing is a shade of black or grey. This means at least everything matches, and I don't have to worry about what's clean or dirty. I prefer brown, but my rainboots are black. So there you go. 4. Kindles and iPods are awesome. Remember when you had to bring 10 mix tapes or albums on a road trip? And 3-4 books? This kind of touring is when I remember how awesome it is to be alive in 2011. Technology rulz. 5. GPS is your friend. Get one. Name her. Be kind to her. It will save you and your tourmate's friendship. 6. Eyeshades and earplugs. Eyeshades aren't just for rich old ladies anymore. They are useful for napping at anytime, as well as for migraines. Also, when touring the north around summer solstice, you get about 20 hours of daylight a day. It's fabulous, but not always fun to wake up at 4am thinking it's afternoon. As for the earplugs, well, your tourmate probably snores. Again -- save your friendship. 7. Pack what you think you'll wear, and then bring half of that. Here's what I'm bringing: 2 t-shirts (1 for everyday and 1 for exercise), 1 long-sleeve t-shirt, 1 hoodie, 1 cardigan, 1 thin sweater, 1 pair of pants that can roll-up to be capris, 1 pair leggings, 1 un-wrinklable dress (for shows), rubber cowboy boots that double as galoshes, flip-flops, packable rainjacket, sneakers (again, stupid exercise), yoga pants, 1 thin hand towel, sunglasses, baseball cap, 3 pairs of underwear, 3 pairs of socks, and 2 bras. Which brings me back to #1: Do laundry daily. I've posed this question before, but I ask again: how do you folks with office jobs ever get anything done? I can't even seem to get to the dry cleaners or my PO Box lately, much less clean the house. Granted, a lot of my time is taken up with things that office-job folks don't have to think about, like sorting receipts and reading "Quickbooks for Dummies." There's all kinds of exciting stuff going on though, and, as usual, never a dull moment. I'm kind of looking forward to my 8-hour plane ride next week, so I'll be forced to sit still. 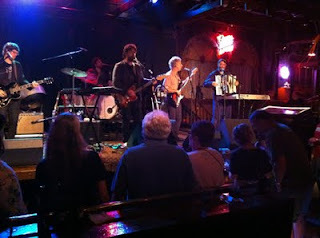 Playing with Bob Schneider on Tuesday at Phoenix Hill was great fun. He's one of those musicians who understands that people are paying for a show, not just a concert. It seems like most people who write about him comment on his good looks, but I think his humor and banter is the best part of his show. And of course, his fantastic band. Conrad and Ollie kept me entertained with their stage moves, but let's not also forget just how good their musicianship is. It makes me wish I could afford to keep a band on the road. There's something fun about playing with the same folks night after night. Things happen on stage and by the end of the tour, you're such a tight-nit group, you might start thinking, "Hey, we should take this show on the road." I'm hoping that happens next week when I kick off my three-week tour of the United Kingdom. Yay! See the next blog for kick-off party details. What a whirlwind weekend that was. I think I may be getting to old to drive 2500 miles round-trip in four days. And when I say "drive" I mean "be driven," since FWT is pretty much the captain of the car. That's okay with me, as I only like driving on the left side of the road, and that doesn't work out too well in America (only occasionally in parking lots). Anyway, I'm home, and even though I slept in the car quite a bit on the way home, I'm still a worn-out sleepyhead. I am crashing early early early after lessons tonight, so I'll be nice and ready for tomorrow night's gig at Phoenix Hill. After 18 hours and thirty-three minutes in my Mom's Camry yesterday, two books, and several podcasts, I am in Texas. You may wonder what a good Kentucky girl is doing away from Kentucky on DERBY WEEKEND. I am wondering the same thing. Thankfully, I remember my TwinSpires.com password, and we're throwing a Derby Party here in Texas. Also, we've got a house full of out-of-towners crashing and celebrating at the Louisville house, so at least it's getting its annual celebration, even if we're not there to supervise. But in good news, the high today is 91 degrees, which is just about the perfect temperature. FWT is taking the cover off the pool at his parents' house right now, and I'm biding my time until I can practice my backflips. I'll keep you posted on my wagering and my Texas Kentucky Derby Party, but in the mean time ... 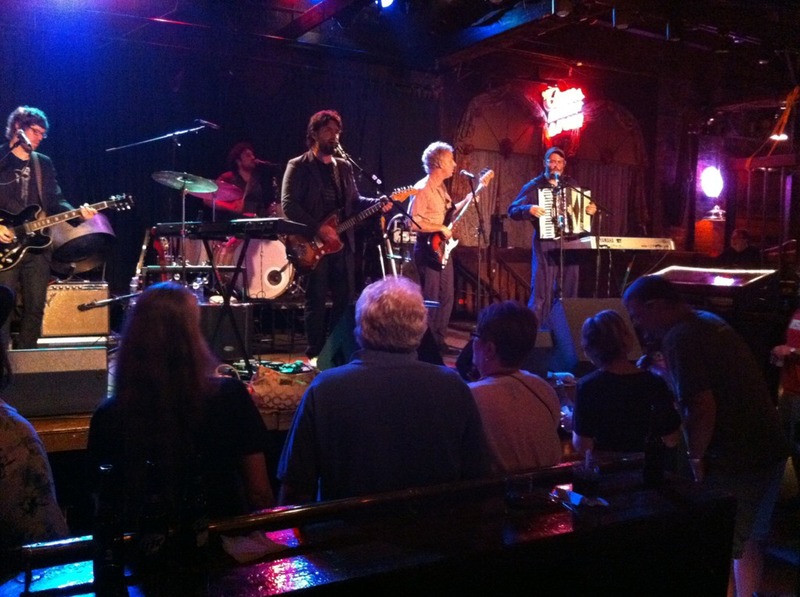 I'll be back in time to play with Bob Schneider at Phoenix Hill on Tuesday, May 10. Y'all should be over your Derby hangovers by then, so I'll see you next week. Last night's gig at the Derby Fest-a-Ville down on the Waterfront-ish was just like Woodstock, minus about 30 degrees and a few hundred thousand people. Really, it was muddy and cold and pouring down rain. Thanks to the folks who braved the weather and kept us smiling. And also thanks to my awesome band who keeps me smiling no matter what the gig is like. My band and I had a good time, but I feel terrible for all those poor vendors. When I went in search of french fries before my set, they were all salivating at the chance to make a sale. Sadly, none of them had any fries made, and I didn't have time before my set to wait. The Brigid Kaelin Band (that's my band!) managed to play one full set, and we had lots of fun ... us and the awesome stage crew. Then the Fest-a-Ville organizers wisely decided to pull the plug on the evening seeing as the weather forecast another huge storm and people seemed to assume the event was canceled anyway. But a good time was had by all who were there. Look out for Ray Rizzo's video-phone, as he got all MTV-style camera winding around the stage during a fun cover of a Carly Simon tune. The best moment was when he panned out to the audience, which, at that point, was FWT. (My parents were backstage.) Who knows if it'll end up online, but I'm preparing myself mentally just in case our on-stage antics are posted to history. If you're out and about in Louisville this month, pick up a free copy of this month's Underwired Magazine, which features a HUGE photo of me by the über-talented Jessie Kriech-Higdon. I'm laughing maniacally and playing the saw in the photo, which is typical for a rainy Tuesday. Also, if you're sad you missed my show last night (and the odds are that you did miss it), you might want to come out to Jim Porter's on Wednesday evening. I'm playing one solo set from 8:00-8:45 before Suzy Bogguss. Other than that ... it's DERBY WEEK! I hope you non-Kentucky readers are planning a big Derby party on Saturday.